C.O. 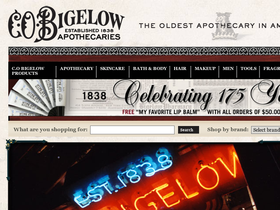 Bigelow, online at BigelowChemists.com, is the oldest apothecary in America. C.O. Bigelow sells their own line of products including face, hair, lip, body, oral hygeine, hands, and feet products. Plus, they offer a variety of haircare, cosmetics, personal care, fragrance, apothecary, mother & baby, homeopathy, home, and home fragrance products from other top apothecary brands such as Borotalco, Tend Skin, Frais, Diptyque, and more. For all the best C.O. Bigelow coupons, C.O. Bigelow promotions, and C.O. Bigelow deals, check out RetailSteal.com. C.O. Bigelow offers free UPS ground shipping for all orders over $75 shipped within the United States. Bigelow also now offers shipping Japan, England, Canada, and Australia. See website for details and exlusions that may apply. Use this coupon code online at BigelowChemists.com and save $15 off your order of $100+. Get free shipping on orders of $49 or more from BigelowChemists.com. Click link to shop now. Shop at C.O. Bigelow and enjoy 20% savings on Derma Remedies. Click here to shop. Sign up to receive special offers at C.O. Bigelow. Click here to shop. Shop at C.O. Bigelow and enjoy 50% savings on 2X Lip Shine Gift Box. Click here. Shop at C.O. Bigelow and enjoy 20% savings on Chapped Hands Soap. Click here to shop. Shop at C.O. Bigelow and enjoy 10% savings on your order. Click here for code.